Abstract: We propose and demonstrate an electrooptic technique for relaying microwave signals over an optical fiber and downconverting the microwave signal to an intermediate frequency at the receiver. The system uses electrooptic phase modulation in the transmitter to impose the microwave signal on an optical carrier followed by re-modulation with a microwave local oscillator at the receiver. 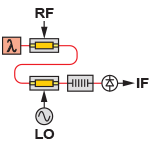 We demonstrate that by subsequently suppressing the optical carrier using a notch filter, the resulting optical signal can be directly detected to obtain a downconverted microwave signal. We further show that by simply controlling the amplitude of the microwave local oscillator, the system can be linearized to third-order, yielding an improvement in the dynamic range.